Toronto satellite services uplinker, TV2GO, supports Canada space mission. When Commander Chris Hadfield’s Soyuz capsule landed in Kazakhstan on May 12 he completed a remarkable 5-month mission on the International Space Station and a memorable series of satellite links by longtime tvz.tv client, TV2GO. Duval of the Canadian Space Agency. 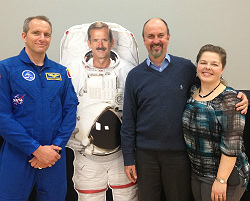 While completing a record number of scientific experiments, Hadfield managed to use every spare moment communicating his enthusiasm for space, environmentalism and music to an avid following back on earth. By the end of the mission his Twitter followers numbered nearly 1 million. His YouTube cover of David Bowie’s “Space Oddity” currently has over 15 million views. 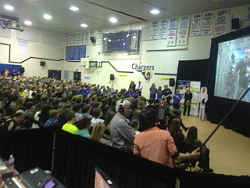 Toronto satellite services company TV2GO won a contract from the Canadian Space Agency to support the mission by linking ISS with students across the country. Eight special events were staged by the CSA in Universities, High School Gymnasiums, Science Centres, the National Aviation Museum and even the Bank of Canada (where Cmdr Hadfield unveiled a new space-themed five dollar note). TV2GO had its uplink truck on-site to downlink NASA TV’s HD Media Channel and to live webcast each event. Music Monday was the finale on May 6. 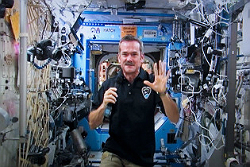 It’s national event to promote music education, approximately 1,000 school choirs sang ISS Is Someone Singing (co-written by Hadfield and Ed Robinson) along with Chris Hadfield, strumming his guitar while floating, weightless in space. 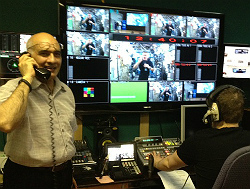 TV2GO mixed three local cameras with the NASA images and webcast via satellite to an international audience. The ISS is in a low earth orbit at an altitude of 400kms. Relative to the ground it’s moving at 28,000 kph, circling the globe every 90 minutes. That kind of moving target requires precision timing as the ku-band video signal from space only has line of sight to NASA’s tracking earth station for 18 to 20 minutes per orbit. For the outbound signal TV2GO would treat it as MPEG4 HD broadcast video, linking back to its Toronto teleport where web streaming took place on the Amazon content delivery network.